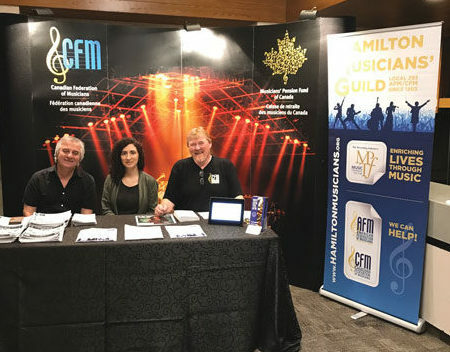 Manning the Canadian Federation of Musicians booth at the Canadian Country Music Association’s Country Music Week are (L to R) Local 293 (Hamilton, ON) President Larry Feudo, AFM Canadian Office Representative Rosalyn Dennett, and Local 293 Secretary-Treasurer Brent Malseed. A deal was reached with the Canadian Country Music Association (CCMA) for Country Music Week, September 5-9, in Hamilton, Ontario. It covers the performances in various locations and venues in the week leading up to the award show. A minimum fee of $200/musician with 10% pension was negotiated. For the awards show itself, which is broadcast nationally, a letter of adherence to the General Production Agreement was executed with the producers. Another provision contained within the agreement is that the Federation is given booth space near the registration area, which has the highest traffic potential during the conference. Rosalyn Dennett from the Canadian Office assisted members of the Local 293 (Hamilton, ON) executive board with greeting musicians and explaining the benefits and services of membership. I would like to thank members of the negotiating team, which was comprised of Local 293 Secretary-Treasurer Brent Malseed, Local 293 President Larry Feudo, and CFM Electronic Media Supervisor Dan Calabrese. Special thanks to Local 547 (Calgary, AB) Secretary-Treasurer Doug Kuss and Local 553 (Saskatoon, SK) Secretary Warren Rutherford for their valuable input. The General Production Agreement with the Canadian Broadcasting Corporation (CBC) expired September 30. A full week of negotiations was scheduled for the last week of September to bargain a successor agreement. The CFM team consists of representatives from the major broadcast centres across Canada, as well as rank-and-file members. We have completed two rounds of negotiations with the Canadian Media Producers Association (CMPA), the first in Vancouver and the latest in Toronto. Progress has been slow as we are developing a first agreement for independent production. There has been significant resistance to our push for a percentage of the streaming revenues. In addition, some of their demands are extreme, such as wanting a complete, one-time buy for all uses of the music, regardless of medium or type of production worldwide, in perpetuity. There are other major issues at play, which I won’t detail at this time. Fortunately, we have had AFM President Ray Hair and Local 802 (New York City) President and AFM IEB member Tino Gagliardi join us at the table. We appreciate their participation and expertise. We have delayed scheduling negotiations with Bell Media, Corus Entertainment, and Rogers Communications, as the results of the CBC and CMPA bargaining and the subsequent agreements will directly impact language, fees, and conditions that will be proposed to those broadcasters. Since the big three have agreed to negotiate together, upon completion, we will have the major traditional broadcasters under a single production agreement. However, I anticipate it will be a long road. Contact has been made with the two Ontario educational channels—TVOntario (TVO) and Télévision française de l’Ontario (TFO)—although no timelines have been set up yet. The agreement is past due for renegotiation, so this will be on our list of priorities. It’s my hope that there will be good news to report in the months to come.